Dedicated on August 8, 2004. A patron of the arts in Watertown, Bobby was one of the founders of the Watertown Arts Council, had served as president of the council for more than 25 years and spent many hours on the council's outdoor art festival and fostering the beautification of the city of Watertown through the installation of three river fountains, the hanging planters on Main Street, Christmas lights and starting the council's circulating art collection. After her death in 2000, the art council received numerous memorials in her name. 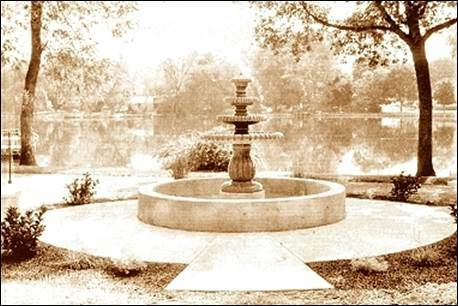 Because she loved fountains, the council agreed that some sort of fountain should be set up in her honor and Bobby had discussed the possibility of a fountain at Fannie P. Lewis Park shortly before her death. The Watertown Branch of the American Association of University Women (AAUW) is proud to sponsor a series of short biographies of Women who made a Difference. As a founder and president of the Watertown Arts Council for 34 years, Bobby Maas spearheaded several projects to enhance the beauty of the city. 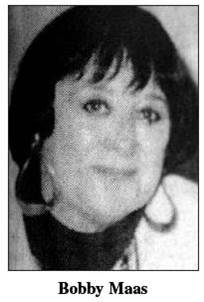 She was instrumental in placing three fountains in the Rock River and hanging pots filled with flowers along Main Street. Under her direction, the Arts Council donated money for new streetlights on the Main Street Bridge, and also made and donated lighted Christmas wreaths for the new street lights. She was a leader in programs to plant more trees around the city and fought to replace willow trees along the river at Riverside Park and Fannie P. Lewis Park. Maas spent countless hours organizing the Arts Council’s annual outdoor art festival and beginning the Council’s circulating art collection. The Main Street Bridge was named for her by the Watertown Riverfest Committee in 1996 in recognition of her contributions to the community. At that time, she was called the art conscience of the community who was not afraid to challenge bureaucrats for programs to help beautify the city. Maas was nominated twice for the Governor’s Award for the Wisconsin Foundation of the Arts for her tireless work in promoting arts in the city. She was also named Woman of Merit in 1986 by the American Association of University Women. In addition to her work with the Arts Council, Maas was an active member of the Watertown Country Club where she had a hole-in-one two times, a member of the Watertown Dance Club and had been very active in the former Watertown Curtain Club. Maas loved flowers and developed an extensive garden at the family home along the Rock River. The Maas flower garden was featured in an AAUW fundraiser in 1997. Maas was born and raised in Watertown, the daughter of Dr. W.W. and Doris Arzberger. After attending Downer College in Milwaukee, she graduated from the University of Wisconsin-Madison. She married Albert Maas Jr. in 1947 and they had two daughters and three grandchildren. After her death, the Arts Council received numerous memorials in her name, and the Bobby Maas Memorial Fountain was installed at Fannie P. Lewis Park in 2004. Maas is remembered for her flamboyance and zest for life. She left Watertown a legacy of beauty and culture. Family, friends and members of the Watertown Arts Council gathered together Sunday noon for the dedication of the new fountain in Fannie P. Lewis Park in memory of the late Bobby Maas. The Bobby Maas Memorial Fountain is a fitting tribute to Maas, a patron of the arts who served as president of the Watertown Arts Council for many years. Family members attending the dedication included Albert Maas, her husband of over 50 years, who lives in the family home he built across the Rock River from the park, located on North Water Street. Several speakers mentioned Bobby Maas’ contributions in enhancing fine arts in the community and her efforts to beautify the city.